The first one, with the hook called for (size I) turned out HUGE. If I put it on, it would literally slide right off my shoulders LOL Turns out the hook size recommended on the yarn label itself is a G. So I have restarted another one on a size G hook in the hopes that this time around it will actually fit me. As I have already done a complete one, I am hoping it won’t take me too long this time around. It took me two days (10/27 & 10/28/12) to get this far. My first attempt to do this pattern got me so frustrated I didn’t even bother to keep track of exactly when I started it. 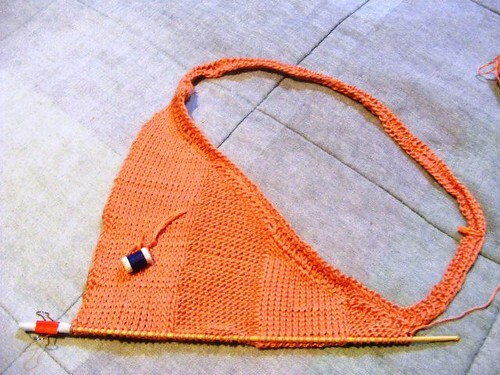 You are looking at the waist line and the first part of the front base triangle. For any interested crocheters, this pattern is from Fall 2011’s issue of Interweave Crochet, which is now available for purchase as a single pattern download from Interweave.com’s online store.